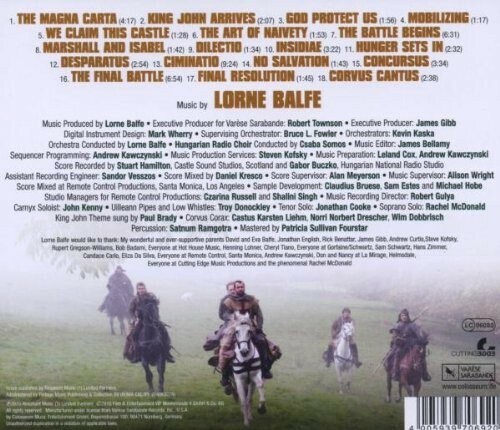 Just by taking a look at the production credits on this compact disc, one can see that the composer Lorne Balfe, has gone to great lengths to create a sound and style of music that is in keeping with the period in which the films story is set. 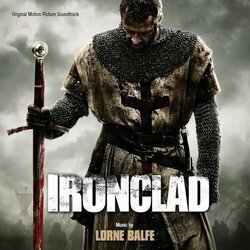 He has utilised a fair number of shall we say lesser known or unfamiliar instruments within his score and fused their own particular unique sounds with that of a more conventional line up of instrumentation. For example the composer makes particular effective use of the Carnyx, which is a Celtic iron Age wind instrument that is held aloft by the player and creates a not only distinctive sound but also one that is somewhat unnerving. I suppose the best way to describe the instrument is to call it an ancient Vuvuzela, but a vuvuzela that has attitude. The instrument which as I have already said is held vertical is made from brass and was used by the Celts and other peoples throughout Europe from around 200 BC through to 200 AD, the rather discordant sound was probably designed to either encourage troops to fight or to unsettle the opposing force in a battle. Either way the sound is piercing and less than melodious but in this case effective. 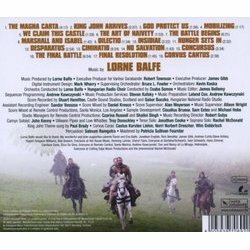 Composer Lorne Balfe seems to easily integrate these ancient sounds into the line up of a modern orchestra and also uses samples, tenor and soprano voices, booming percussion, full choir and electronics to further bolster, enhance and embellish this line up. The composer further explores the use of vintage instruments by employing, Uilleann pipes, that are a type of bagpipe which originated in Ireland and are sometimes referred to as elbow pipes, because the air in the bag is controlled by a small bellows which is positioned under the elbow of the player. The pipes are softer and slightly less harsh sounding than others and bring a certain calming almost lilting tender sound to the work. 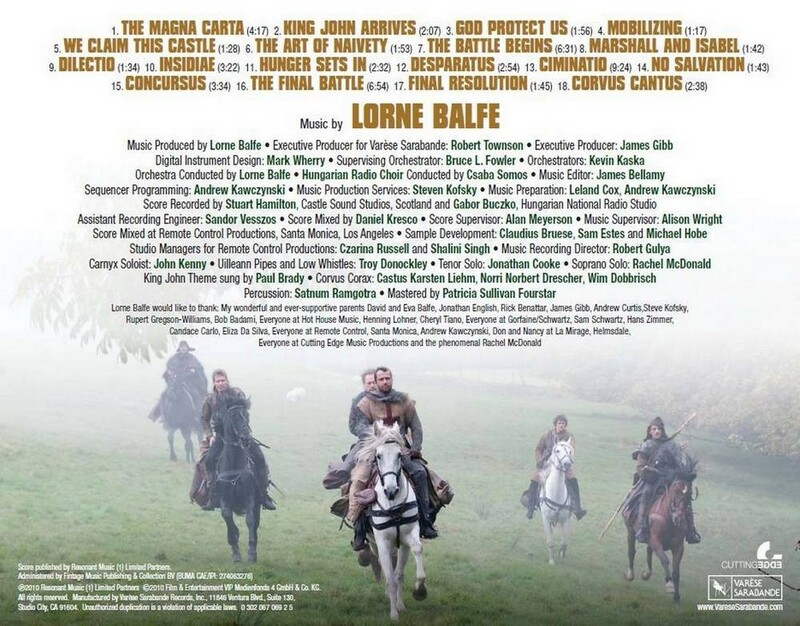 All of these musical elements combine and compliment each other to create a score that is at times highly exhilarating but also posses a softer side and is certainly imaginative and most definitely inventive in its make up. I think track number 9, CIMINATIO is the cue that showcases many of the elements utilised with the score, it begins in a slow and is rather pensive and subdued at first, then the cue segues into a more urgent sounding mode heralded by a short stabbing blast from a Carnyx, driving strings underlined by percussion and pushed forward by strident sounding choir step to the forefront of the composition creating a powerful and dominant atmosphere. This combination however soon gives way to a heartfelt almost celestial and calming interlude that although brief is affecting, the short and haunting respite is motioned aside by percussion and strings that build in both volume and intensity and gather momentum with growling brass adding power and substance underlining and punctuating every step of the way. A slow and serene atmosphere returns mid way through the cue but again is overwhelmed by driving percussion and strings, which bring the cue to its conclusion. This is an addictive listen, it has peaks and lows, drama and emotion, calming components and high octane passages, an creative work which evokes many moods and contains numerous musical colours. Well worth investigating.